NWA is one of the most influential musical groups of all time. When people talk about rap music or music in general it is rare for them not to come into the conversation. Even when you consider who were in the group separately it would be difficult to deny the impact people like Dr Dre and Ice Cube have had on the music business. Straight Outta Compton tells the story about how these people came together and started a revolution of music where their type of music was general either underground or ignored completely. The group consisted of Dr Dre, Easy-E, Ice Cube, Mc Ren and DJ Yella. They did not sugar-coat the truth, they told their lives as they saw it to music with classic songs such as F**k tha Police, Gangsta Gangsta and Express Yourself. They excited a generation, but the film does not shy away from the dark times which lead to the breakdown of the group and the aftermath. When I first watched this film in the cinema, I was totally blown away by it. I am not a huge fan of this type of music, but I will not deny that as soon as I came home I added many of the tracks featured in this film and I was blown away by how relevant a lot of their music still was. Not sure if that is a sad reflection on society or not. This film is a masterpiece in every sense of the word and I cannot begin to describe just how great this film is. It is a shame that Director F.Gary Gray was not nominated for Best Director at the Golden Globes, though hopefully BAFTA or the Academy rethink that one as I think this film is one of the most perfectly constructed pieces of filmmaking I have ever seen. The pacing, the interweaving of stories was fantastic and at no point did I get bored by anything. It could be argued that at nearly two and a half hours it could be a little excessive, but what makes the film even better is the fact that it doesn't feel like it and when I heard this was a Director's Cut adding additional footage, I was overjoyed and this cut doesn't bog down the story or dwell on anything other than the things you want it to dwell on: The Music. Performances by everyone (who have all been nominated for the Screen Actor's Guild Award for Best Ensemble) is perfect with Ice Cube's son O'Shea Jackson Jr putting on a fantastic debut performance as his father. Corey Hawkins and Jason Mitchell as Dr Dre and Eazy-E are both enigmatic in their roles and the ensemble works perfectly. Paul Giamatti is as wonderful as he always is playing the band's manager Jerry Heller and though I enjoyed his performance in Love and Mercy better, this was a much more subtle performance and one that I do hope he gets some recognition for. This Bluray is jampacked with extras and anyone who wants to own this film should really get it as there is so much you could probably spend a good day watching it all. Commentary by F.Gary Gray is nice, but as with all commentaries I do always feel that there should be at least two people so that they have someone to bounce the conversation off. That being said, it is filled with great stories about the creation of the movie. There are multiple featurettes and behind the scenes footage with members of the NWA reminiscing about the events featured in the film. For fans of the group these are all fantastic and their thoughts on what happened and how much of an impact it had not just on their lives, but on society too is very interesting. There is also multiple looks at the creation of the film with the Director which are great. Also included are Deleted Scenes which are fine and could really have been added to this extended cut as they were not useless like a lot of deleted scenes. 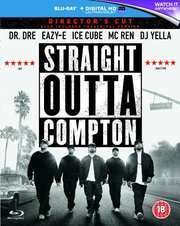 Straight Outta Compton is one of the best films of 2015 and it would be awful if it is overlooked at the Oscars. If you are a fan of the band you will already have seen this multiple times and will not need to be told to buy this, but if you are not and want to watch a truly great film, then you may want to give this a look.